Arizona Christian storms back for 4-3 win in the Eagles’ final home match. Biola took on Arizona Christian University on Saturday for their final home match of the season. Despite a win from the lone senior on the team, David Garcia, ACU closed the match with four straight singles wins to claim victory 4-3. Things looked bad early in doubles for Biola as the No.1 team of sophomores Quentin Lau and Logan Blair fell 6-0. However, senior David Garcia and junior Derek James claimed a victory at No.3 6-3. The Eagles clinched the doubles point with a 6-3 win from junior Erik Martinez and freshman Edwyn Ramos. Blair made quick work of his opponent on the No. 3 court, claiming the first singles win by a score of 6-4, 6-1. In his final match at the Biola Tennis Center, Garcia went out on a high note with a 7-5, 6-3 win on the No. 6 court. Then, the Firestorms started to turn things around and mount a comeback. Ramos dropped a tough three-setter on court one 6-4, 3-6, 2-6. Then freshman Andres Meneses fell on court five 3-6, 6-3, 3-6. James took a tough loss on the No. 2 court 7-5, 2-6, 1-6. This set up a decisive match on court four, where Lau ultimately lost 6-2, 4-6, 2-6. Garcia prays with his opponent after every match, and he reflected on what it looks like to show your faith on the court. 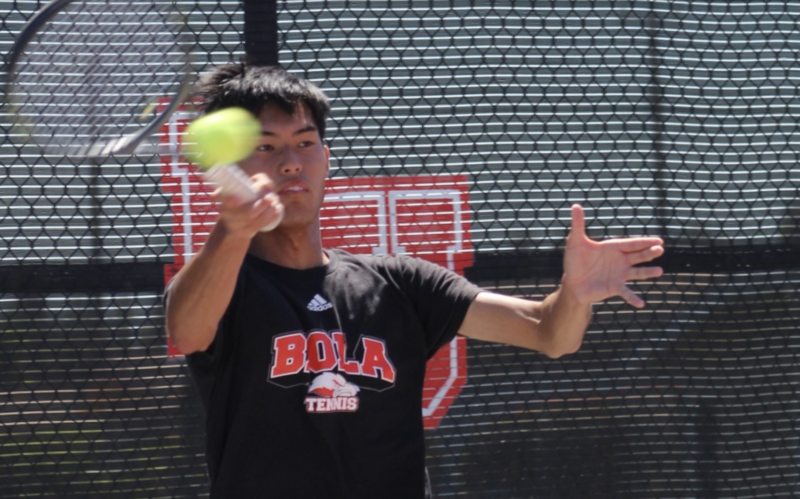 Biola finishes the regular season at 9-12 and will wrap up their season at the PacWest Championships in Surprise, Arizona on April 17-20.